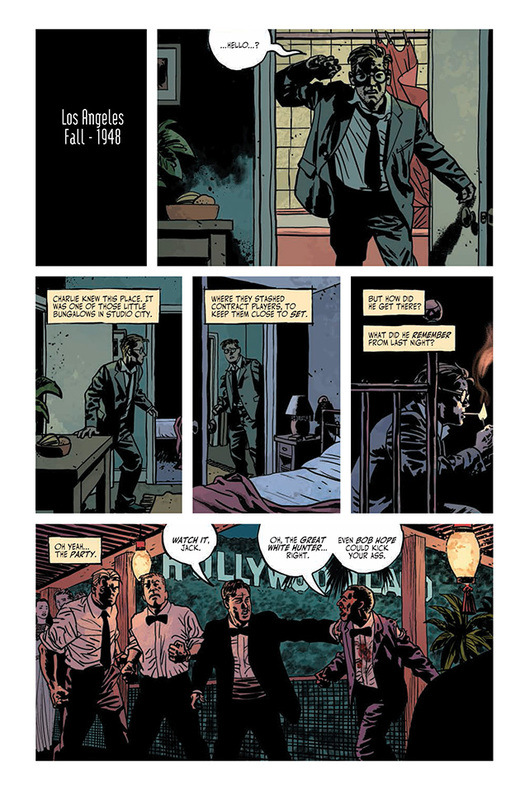 This is the first installment of a mid-length graphic novel set in 1948 Hollywood. There are three acts in total. It's a collection of a serial comic. If you like noir stylings, this story has that in spades. You can almost smell movies like In A Lonely Place, LA Confidential, The Black Dahlia and The Big Sleep wafting from the pages of this story. The Fadeout is not just a collection of cliches and tropes though it certainly puts those to good use. It's a pretty fast paced murder mystery that is both firmly rooted in a certain place and time and like most good literature, universalist in message. There is some violence but if you'll pardon the pun it's not comic book violence. This is serious stuff. In some aspects this is a detective procedural with the most unlikely of protagonists. The writers skillfully mix fictional and real characters in the story. This novel takes the reader back to a time when Hollywood was more literally the land of illusions and dreams. There were no 24-7 gossip websites. People with sexual tastes outside of the norm had a big incentive to keep those desires secret. This went even double for the studios. If a Hollywood glamour queen preferred men of a different race than her own or a Hollywood leading man liked men, the studios would do their best to keep that information strictly on the hush-hush and down low. Only those who needed to know knew about such things. What was later called sexual harassment was rampant. And if a powerful man liked starlets that weren't necessarily of age in all 50 states, then he could do as he pleased, as long as his movies were selling. The lead character in this tale of Hollywood Babylon is Charlie Parish, a WW2 veteran with a drinking problem and what would today be called PTSD. Charlie is a writer for one of the big studios. Like many Hollywood writers, Charlie has relatively low social status within the Los Angeles entertainment circles. Sometimes this bothers him. Sometimes it doesn't. But what does bother Charlie is when after a drinking binge and blackout he wakes up in a house where the actress Valerie Summers was murdered while Charlie slept. Now waking up next to a corpse will just ruin your day. Charlie has trouble remembering who brought Valerie to the house or if he was intimate with her. So Charlie decides that the smart thing to do is the exit the premises and hope nobody sees him. Strangely however, he reads in the papers that the actress committed suicide. And there is other information put out about the dead actress that Charlie knows isn't true. Fitfully and reluctantly Charlie decides to start looking into what really happened. But he has to be careful. Charlie does not want to be fingered for the murder. And if the studio head of security, Phil Brodsky, a brutal and intelligent ex-cop, is directing the cover-up, then Charlie's physical safety and life will be in jeopardy. Phil doesn't play around when it comes to business. Phil is an intimidating sort of fellow who doesn't mind hurting people. In fact he seems to like it. Phil still has a lot of friends on the force. And he has carte blanche from his bosses to do whatever it takes to protect the studio and its investments (actors and actresses) from scandal or fraud. In the meantime the film Valerie was working on is over budget and behind schedule. The show must go on There's a lot of money at stake in this movie. There are a lot of reputations on the line. The movie has to be made. It has to be a hit. Although Charlie is a "writer", in fact a great deal of his work is ghostwritten by his blacklisted friend Gil. Gil has his own ideas about who killed Valerie. And Gil, though a worse alcoholic than Charlie, is getting tired of having to live in shadows because of his alleged political affiliations. This causes static between the two men. Gil's getting more resentful of Charlie. And Charlie's and Gil's occasionally inept attempts to discover the truth around Valerie's death threaten to expose some even uglier secrets better left alone. This is a moody realist story that draws you into its pages. Most of the people, men and women, are compromised in some way. The question isn't who's lying, it's more about who isn't lying. Some people, like a cute woman, Dottie Quinn, who makes up utterly fictional biographies for movie stars, are okay with this facade of lies. Dottie is able to float serenely through the corruption and lies without letting herself truly be part of it. She wouldn't mind teaching Charlie how to do that. She wouldn't mind teaching him some other things as well. Other people claim to want to know the truth, even though they're probably lying to themselves about that desire. Charlie is a complex character who will cause the reader to love and hate him, maybe in even measure. In many aspects he's someone who is always reaching for more than he can hope to have. This may fuel his depression but paradoxically it also gives him optimism. The color schemes are wonderful here, very enjoyable. 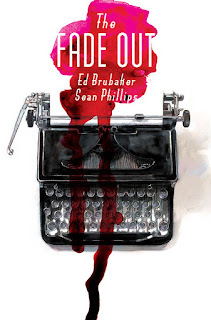 Everything looks very real.The very nature of a graphic novel lends itself to conciseness but even more than usual The Fadeout fits very well with a laconic noir theme. This is worth reading. Eat a Bug and Save The Planet!